The biggest Intercultural 3on3 Basketball Tournament in the country turns five years old! This year, it promises to change everything you thought you knew so far: Athens’ most favorite tournament becomes a festival! 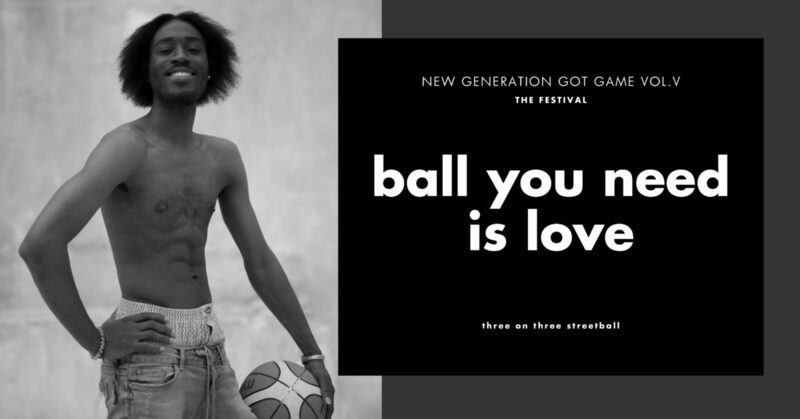 On Thursday 14th & Friday 15th of June, Technopolis City of Athens opens its doors and welcomes the New Generation Got Game vol.V: B/all you need is love! Non-stop music, food, dancing and bazaars from the migrant communities in Athens, parallel events with skatepark, graffiti, floor board games for kids and workshops of African drums, dance and percussion will accompany two days of tough game in the open courts! And who will be the PRO player of this year’s tournament? People say he is the ace of Olympiacos, having passed by the NBA Houston Rockets, a player with a remarkable social consciousness! With great pleasure we announce Kyle Wiltjer as the man of the hour in our New Generation Got Game vol.V! He will not only participate but will bring with him the clothing brand he just released, named EQLTY! Once again, many professional players will actively support the event, many more gifts will be given in basketball competitions throughout the games, while everyone will compete for the big prize: The winners of New Generation Got Game will have the opportunity to travel to the island of Syros, to participate in the LG AegeanBall of Giorgos Printezis, all expenses (ferry, accommodation, food and entry fees) covered by Generation 2.0 RED! In these two days, young people from all over the world will use basketball to show how it does not matter where you come from, how you look, what religion you practice, or what is the color of your skin. All that counts is what you bring to the game.